Have you ever caught yourself telling someone that you know or are related to a person of notoriety, or at least suggesting that your connection with them is more direct and personal than it really is? It’s because ordinary folk like me subconsciously ascribe greater worth to noble, famous, wealthy, accomplished, and clever people, perceiving them as of greater value than I am, and that being associated with them might elevate my own sense of self-worth. That’s partly about insecurity and partly about pride. The truth is however that we all like to feel important and valued – it’s a basic human need. When overseas, visiting and working with churches, people like to talk about where I am from. 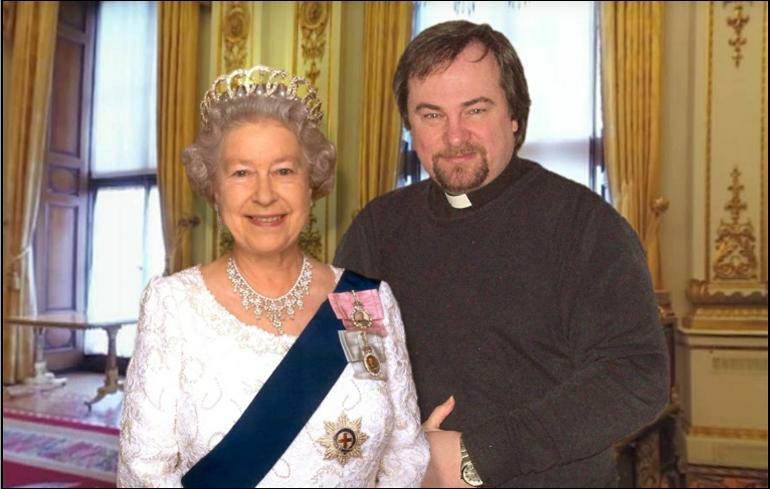 When asked this when in North America in 2000, I was telling the person that I’m from the UK, they asked, “So have you met the Queen?”. Now I know the UK is comparatively small, but there are sixty-five million of us and I found it irritating that they think we’re so small that we all know Her Majesty (I don’t of course – the picture above is fake!). It’s like living in Dunblane, we all know Andy Murray don’t we? (lots do of course but others might imply they are friends when in fact they greeted him in the street one day). This means that you can probably discover that you have a connection of six stages or less with any dignitary, celebrity, or nobody, anywhere on earth. It’s a fascinating theory and I’d love to hear what you discover if you explore your own links and connections. It is widely understood that success in almost any sphere, whether commerce and industry, charity, church, or social life, depends on our ability to form relationships and establish links with others. The contemporary word for this is ‘networking’ – people and organisations that are good at networking generally get along very well and are productive. Those that are insular and don’t relate well to others, not so much. The church is about relationships; genuine, sincere relationships, built on trust, integrity, affirmation, tolerance, grace, respect, vulnerability, and love. People are separated from each other by so many things, cultures, rights, ideologies, religion, and also mountains and seas. But what ties us together is our need for love, family, need for purpose and meaning, and of course the image of our Creator (from whom we also separate ourselves). What caused our separation from God anyway? Simply this; that the pursuit of our own ambitions, impulses, and status became more important to us than our relationship with and love for God and each other. But every Easter the church is freshly inspired to share with everyone the wonderful news that there need be no degrees of separation between any individual and the God of all creation. And through that connection we are linked to everything else. By the death and Resurrection, every believer is connected directly to the life of God in Jesus, and consequently reconciled to each other as sisters and brothers. So whether at home or overseas, when someone asks me, “Do you know Jesus?”, with that prayer of Jesus in my heart I can say with integrity and confidence, “Yes, He is my closest friend”. You too can say that, not because of your prestige or high connections, but because of the unconditional and unbiased love of God which invites you through the Cross of Jesus into intimate and eternal relationship with Him. And that’s the Easter joy that should fill every human heart all year round.